We may still be in denial about it, but cold weather is officially here. While summer has its own host of home maintenance problems, like greater pest and termite activity, cold temperatures and harsh weather can cause a myriad of issues as well. Whether you have a listing that won’t seem to sell, or a vacation home in Florida calling your name, remember to winterize the home before leaving it unoccupied for prolonged periods of time. Why is winterizing your home or listing so important? First and foremost, you can prevent disasters from occurring and leaving lasting damage. There are 3 main parts of the home that should be paid close attention when winter is approaching: doors, windows, and pipes. Doors and windows allow air to leak even when they’re closed, and the energy lost can be significant when the temperature is low. Freezing temperatures and accumulated snow and ice can damage both the exterior and interior of the home. Any stagnant water in the pipes can freeze and expand, potentially causing the pipe to burst. This can cause massive moisture damage depending on the size of the leak, and the longer the home is unoccupied, the more likely a leak can go unnoticed. If you are planning on leaving a home unoccupied for a few weeks or more, consider having a professional winterize the home. Our inspectors have years of experience, and can accurately and efficiently winterize your home or listing. 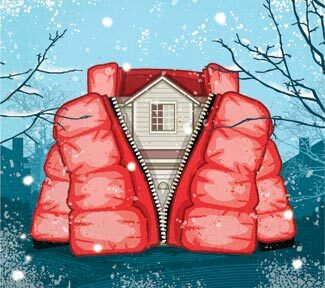 Professional winterizations take the hassle and worry out of trying to winterize and de-winterize everything yourself. Air compressors blow water out of pipes. This ensures that water won’t freeze and cause the pipes to burst. Antifreeze is placed in all the drain traps. Water heater is drained and shut off. Heat is turned down to save energy (and money). Our winterizations are guaranteed so long as we do BOTH the winterization AND the de-winterization. Also, if you choose us to winterize your listing and then receive an offer on the home, we offer de-winterizations for less than half the price when performed in addition to the regular home inspection. Insulate your pipes, especially in areas like the garage, crawlspace, and basement, where temperatures are typically colder. This can be done relatively easily with foam pipes. You can read more about how to do this here. Add more insulation to your attic. Attic insulation is most effective around 10-14 inches thick. Measure your insulation with a ruler to determine whether you need more. By adding the proper amount of insulation, you can typically save anywhere from 10 to 50 percent on your energy bill each month! Weatherstrip windows and doors. Even if the home will be occupied during the winter, weatherstripping doors and windows that you don’t use often can keep a lot of heat inside the home and do wonders for your energy bills. There are several different types of weatherstripping to choose from. Check out this list from the Department of Energy here for a comparative chart before you get started. Check up on your furnace and change the filter if necessary. Furnace filters should be changed about once every month during colder months to get the most life out of the furnace.